Sally Kimball leads a very full life. She's the owner of a high-end fashion boutique in Palm Beach, Florida called Classic Collections; the editor of the online magazine CHIC! ; and the host of a weekly news and radio talk show called The Fashion Connection that is broadcast to the Palm Beaches and Florida's Treasure Coast every Thursday from 5:30-6 pm Eastern time. Fans can keep up with Sally by logging on to www.classiccollectionsconnections.com. Perhaps her biggest coup, though, is her recent partnership with 1stDibs.com, the upscale worldwide online marketplace. 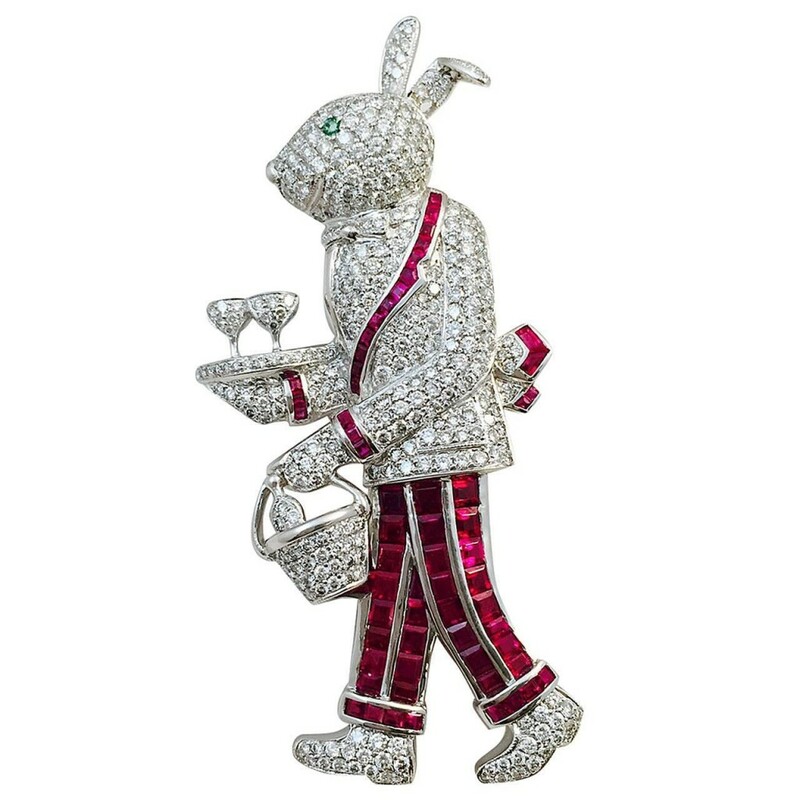 “Classic Collections has been selected as a 'Fine Jewelry Dealer' by the editors of 1stDibs,” Ms. Kimball said. “This means we'll be able to showcase our clothing, handbags, accessories and costume jewelry under our 'Fashion' designation, and feature our fine jewelry, including custom pieces, antique and estate items and fine branded jewelry under our 'Fine Jewelry' designation. As a result, we can now offer our consignors a special service and an additional platform to promote their merchandise to collectors on a global basis.” Visit www.1stdibs.com/dealers/classic-collections/. 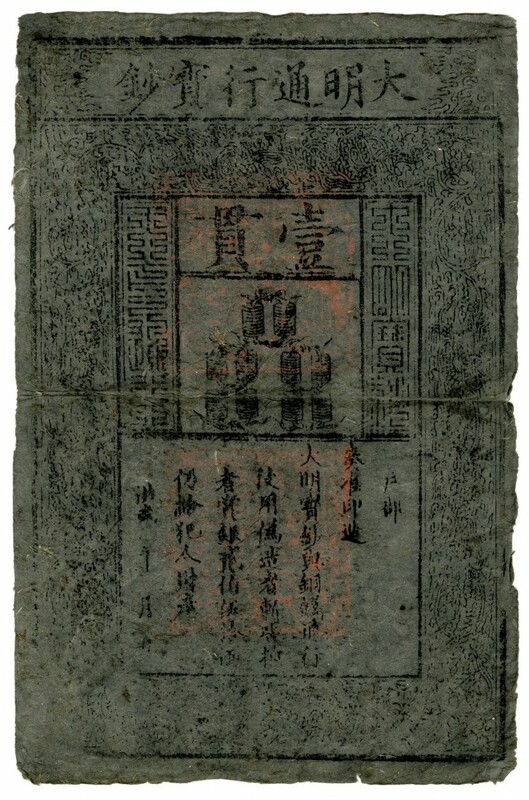 One of the very earliest examples of printed currency known – a Chinese Ming Dynasty banknote dating back to the 1360s – will be just one of the many expected headliners at Archives International Auctions' next big sale: a two-session public auction slated for Monday, September 26th , in the firm's offices at 1580 Lemoine Avenue in Fort Lee, New Jersey. The sale will feature around 750 lots of Chinese, Asian and worldwide banknotes, scripophily (stock and bond certificates), security printing ephemera and coins, starting at 10:30 am Eastern time. Highlights will include a collection of Hong Kong and Shanghai Banking Corporation specimen and issued banknotes from an old Canadian estate, all very high grade; a pair of rare and attractive Chinese Russo-Asiatic Bank and Russo-Chinois banknotes; rare and colorful private scrip notes from an estate find in Denver, Colorado; a new find of Chinese specimen banknotes from the German printer G&D, consisting of a set of 1925 Ningpo Commercial Bank specimens; and a Sino-Belgian Bank $10 Mexican dollars specimen. Visit www.archivesinternational.com. East Meets West, Great Estates – it's all good! Sometimes when an auction house is planning a 'Discovery Sale,' that can be code-speak for clearance event, where they just want to move old inventory and clear some space for better items on the way. But when you hear the words 'East Meets West' or 'Great Estates' auction, it's a good idea to investigate further. At Rago Arts & Auction Center's upcoming Sept. 9-10 auction dates, both of these themes will be explored, first with a coins and currency auction on Sept. 9th, and then with a wild and freewheeling 700-lot event the following morning. Offerings on Sept. 10th will include a circa 1940 Wall Street and Nassau Street sign (est. 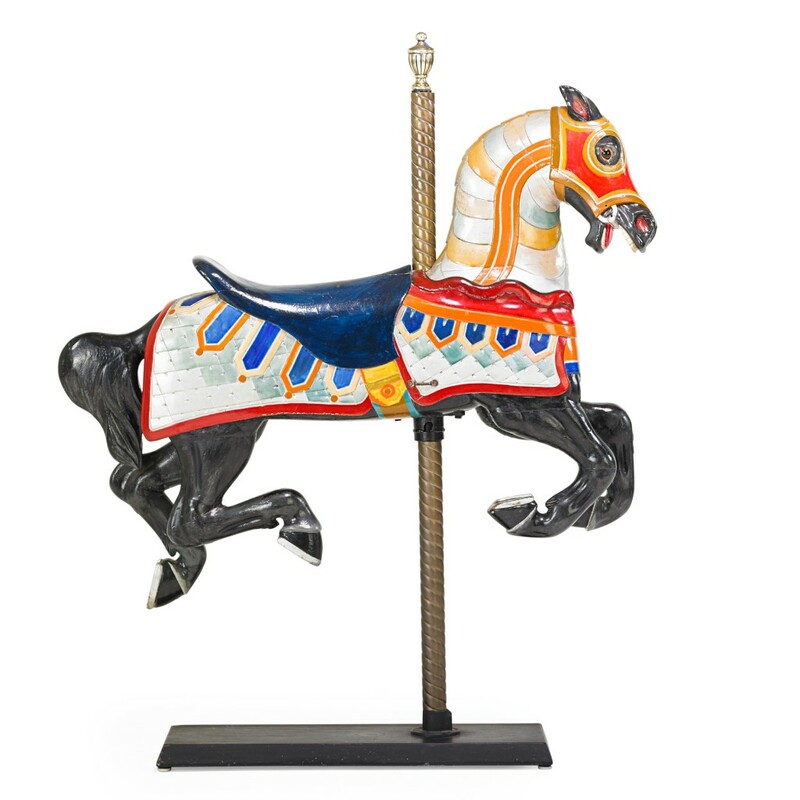 7,000-$10,000); a Stein & Goldstein carousel horse (est. $7,000-$10,000); a Russian Imperial enameled silver liqueur set (est. $5,000-$7,000); a George II mahogany serving table (est. $8,000-$12,000); a silver tea service by John Rhodes for Georg Jensen (est. $2,500-$3,500); a pair of Chinese zitan Baitong inset armchairs (est. 10,000-$15,000); and a Japanese silver and cloisonné vase (est. $4,000-$6,000). See what I mean? Great estates! Visit www.ragoarts.com. When thinking of Mexican artists of note, names like Frida Kahlo and Diego Rivera come instantly to mind. But don't discount Rufino Tamayo (1899-1991), the Mexican painter of Zapotec heritage who wow'd the art world with his figurative abstraction works rich in surrealist influences. 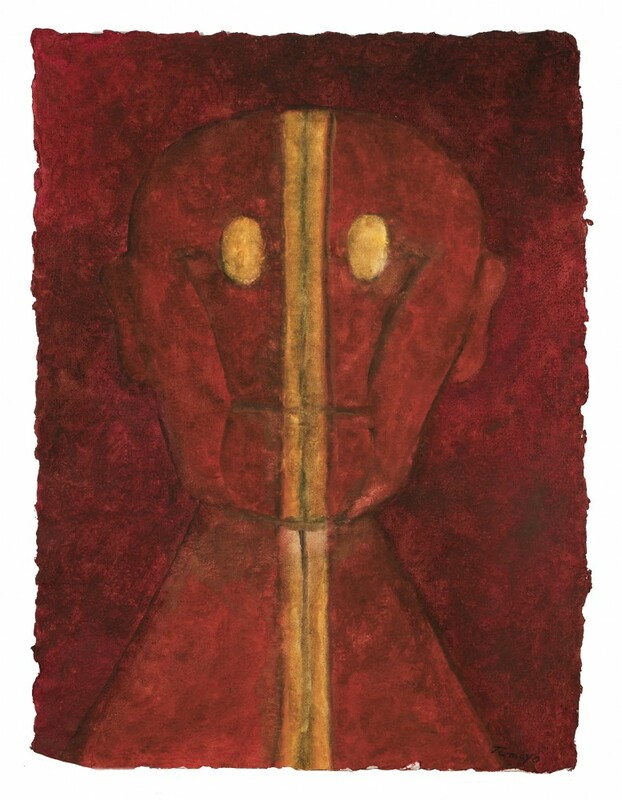 The painting shown here by Tamayo, titled Cabeza Roja, is a painting in gouache, watercolor and crayon and will be offered at John Moran Auctioneers' September 10th Decorative Art Auction in Monrovia, California. It's expected to sell for $100,000-$150,000. Interesting story: Rufino's 1970 painting Tres Personajes was purchased by a Houston man for his wife in 1977, but it was stolen from their storage locker in 1987 during a move. In 2003, a woman named Elizabeth Gibson found the painting in the trash on a New York City street curb and brought it home. Years later, she saw the painting featured on a PBS Antiques Roadshow segment titled Missing Masterpieces. She and the former owner agreed to sell the work at a Sotheby's auction in 2007, where it gaveled for $1.049 million. Visit www.johnmoran.com. It isn't hard to figure out that tobacciana is another way of saying smoking collectibles, namely items related to cigars and cigarettes. Examples of tobacciana go back decades, to a time when smoking didn't carry the negative stigma it does today and the products surrounding the habit were celebratory in fact. My, how times have changed. But, in the 1980s and 1990s, cigar smoking did come into vogue, and the popularity of related collectibles enjoyed a spike. Today, tobacciana is a very strong category of collectible, with some items enjoying nice high prices. 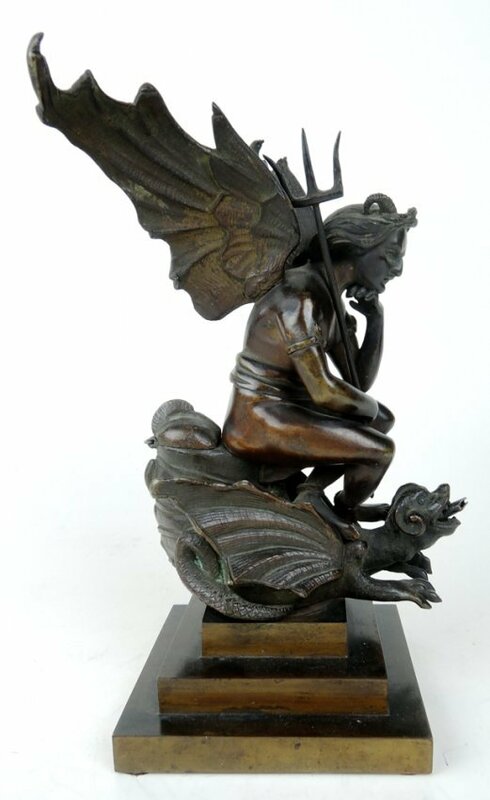 Consider the bronze sculpture cigar lighter pictured here, made circa 1880s and modeled as a winged devil riding a fantasy creature. It's lot #50 in Treasureseeker Auctions' September 11th online-only sale of important cigar lighters, tobacciana, art and antiques (the company is based in Pasadena, Calif.). The way this 8 ½ inch tall lighter works is, the wick protrudes from the bottom of the creature and fuel enters into its back at a hinged element. This surefire conversation starter is estimated to bring $3,000-$5,000. Visit www.treasureseekerauction.com.